Born: 1826?? in KY, possibly Hardin Co.
Andrew Jackson 1856-1922, triplet, married Callie Summers, Became Preacher, Buried at Oak Grove Cem, death cert. Nancy is one of the older daughters of Allen Orrick and Martha Hardin. She was probably born in KY just before the family moved from Hardin Co KY (where Allen and Martha were married) to Warren Co TN along with Allen's father Lewis Orrick and his wife Elizabeth. Nancy never married, but had kids by John Rains, a neighbor in Cannon County. The kids used their Mother's name - Orrick. There are many Orricks today decended from Nancy and Mr Rain's son Andrew Jackson Orrick. This is proven by DNA testing. Exactly which Mr Rains is still being researched.
" 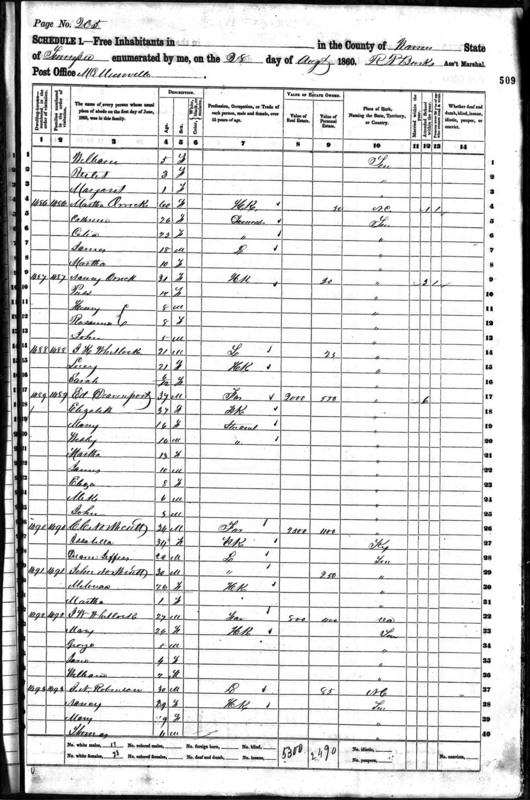 My Grandmother Orrick had four children. My mother Elizabeth, then triplets - Uncle Jack, Mary, and Henry. Henry died when he was quite young. Aunt Mary just lived to be 22. So my mother and uncle Jack were the only two left. Uncle Jack was a Baptist Minister, and a good man. His wife was Callie Summers. " "Jack" here is Andrew Jackson Orrick/Rains. 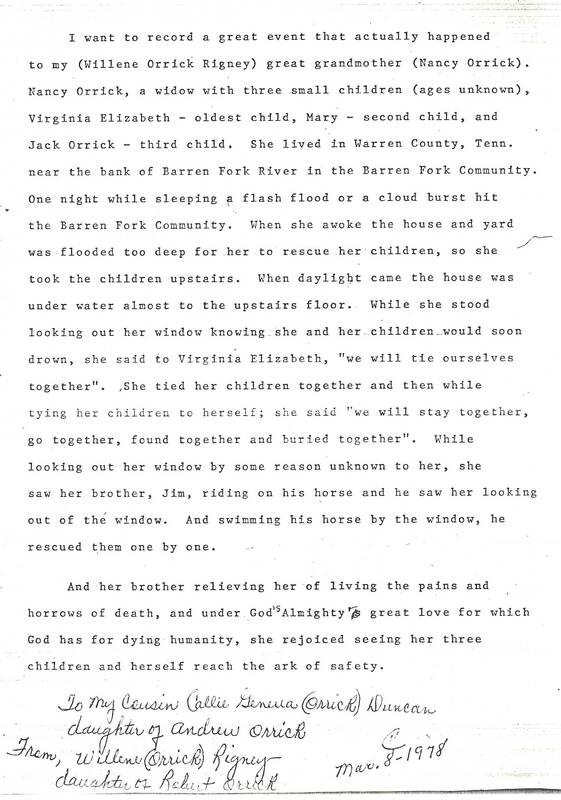 This letter was written by Willene Orrick Rigney in 1978 to document a family story of a large flood that Nancy and children narrowly escaped. I've been unable to find another account of this story to pinpoint the time.
" One night while sleeping a flash flood or cloud burst hit the Barren Fork Community. When she awoke the house and yard was flooded too deep for her to rescue her children, so she took the children upstairs. When daylight came the house was under water almost to the upstairs floor. While she stood looking out her window knowing she and her children would soon drown, she said to Virginia Elizabeth, "We will tie ourselves together". She tied her children together and then while tying her children to herself; she said "We will stay together, go together, found together and buried together". While looking out her window by some reason unknown to her, she saw her brother, Jim, riding on his horse and saw her looking out the window. And swimming his horse by the window, he rescued them one by one. And her brother relieving her of living the pains and horrows of death, and under God's almighty great love for which God has for dying humanity, she rejoiced seeing her three children and herself reach the ark of safety. " 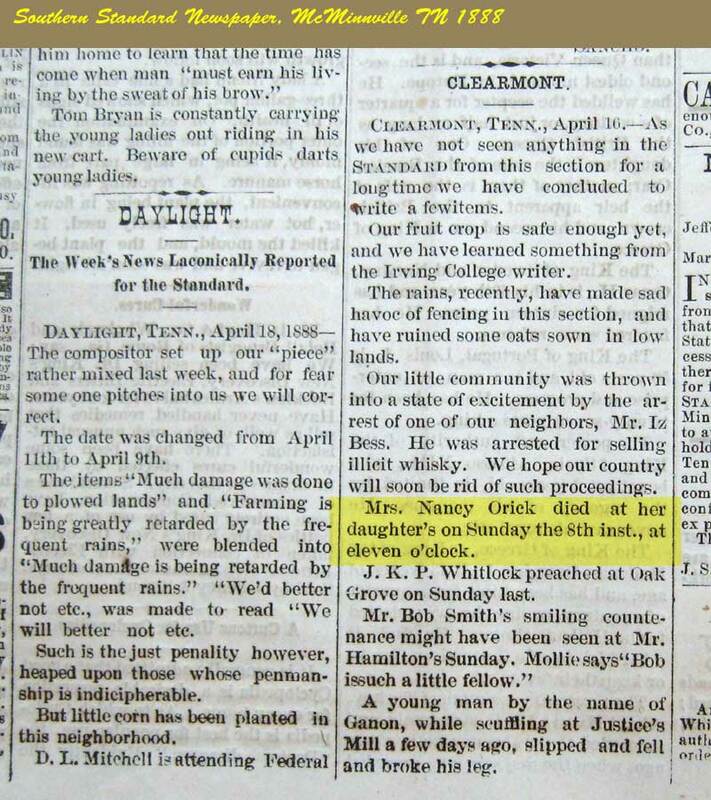 Glenda Stubblefield Cantrell posted this story from the Central Gazette: McMinnville, Friday, March 24, 1848. This story sounds in the right area about the correct time.
" There was more rain fell here from Sunday night last, until about 10 o'clock on Tuesday morning, than was ever known to fall before, in the same length of time, in this region---Consequently, the water-courses up here in the mountains, have been swollen to an almost unprecedented height---some say that the Barren Fork, which runs near this place lacked one foot of being as high as it was at the great freshet in 1842---while others contend that it was some 18 inches higher. The bridge across the Barren Fork near this place withstood the torrent, but has received considerable injury. The grist and saw mills of S. D. Rowan, Esq., two miles below town, on the Barren Fork, were swept away. The loss to farmers in fencing has been immense. We hear of one farmer who has lost ten thousand rails. This loss comes upon them at a most unfavorable season of the year. We have heard of no other mills being swept away, but Mr. Rowan's, but we have as yet heard but from a small portion of the County. " In April 2008, Kenneth Leard Orrick participated in the Orrick DNA test run by Roger Arrick. 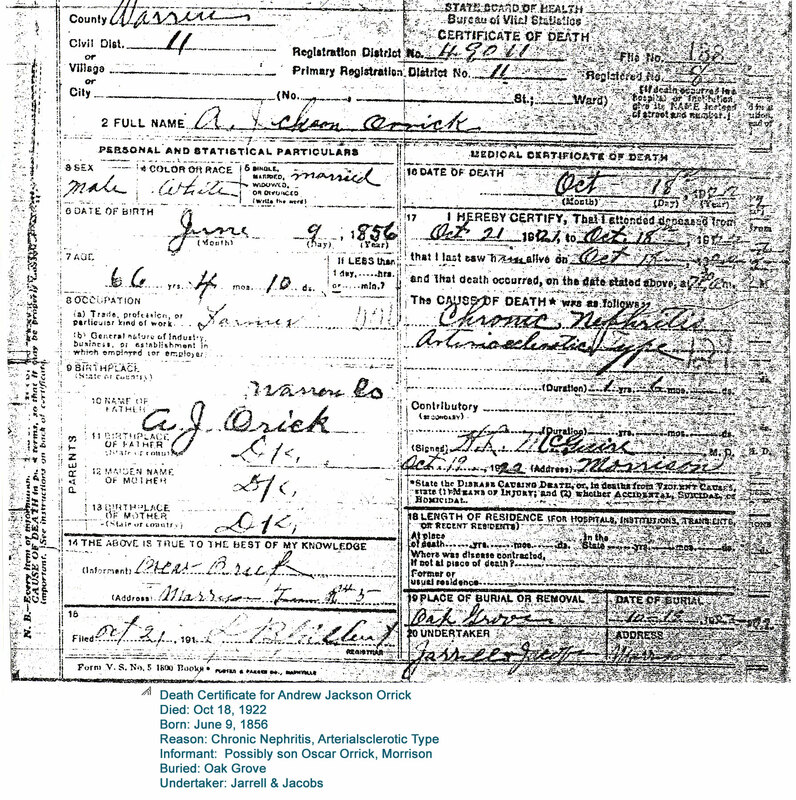 Kenneth is a descendant of Nancy through father Marvin Leard Orrick, grandfather Albert Pearly Orrick, and greatgrandfather Andrew Jackson Orrick. The test came back negative for a match to any other Orricks in the study, and positive for several Rains/Raines families. This essentially confirms family stories of Nancy's children, at least Andrew Jackson Orrick, of being fathered by John Rains. This data will also be helpful in tracking John Rain's line since there are several separate Rains groups apparently. There remains some question about which John Rains was the father because there are a couple of possibilities. The John Rains that married Mary Webber is the best candidate according to some researchers. They both are buried at the Cherry cemetery in Cannon Co, TN.
" Also cousin Colonel Wood told us John Rains was grandpa's dad. 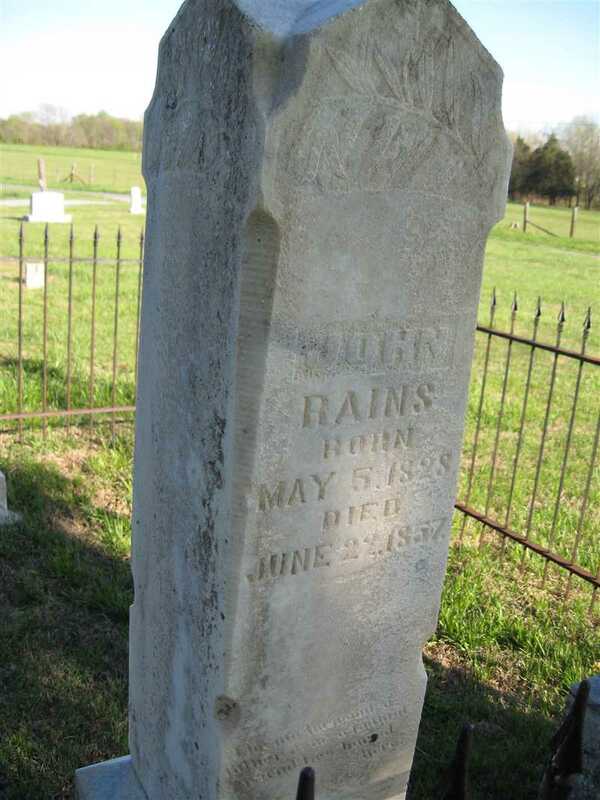 John Rains born may 5-1828-died June 22, 1857 his wife Mary born 1832 died 1892. They had 3 children Rebecca + John W. died very young + was buried at Cherry cemetery in Cannon co. they have a steel fence around their graves + very expensive rock for that time very tall rocks. 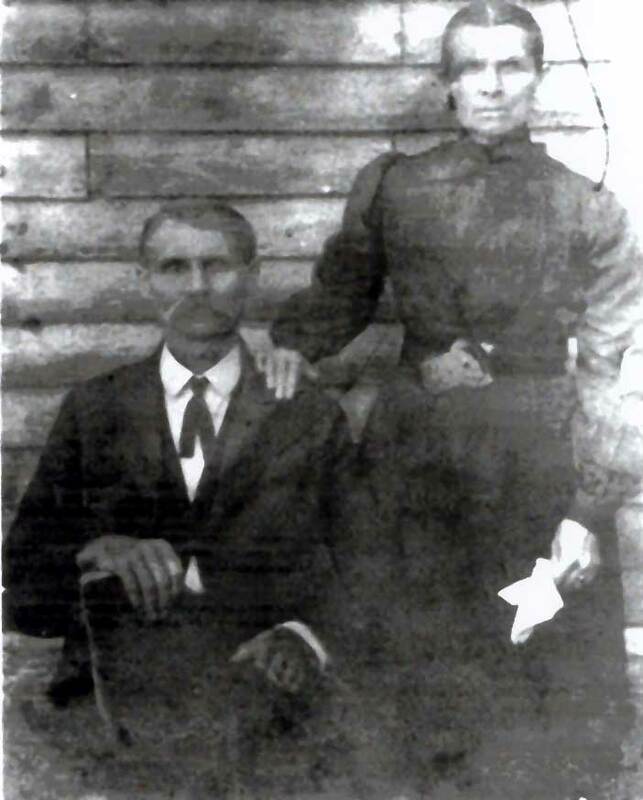 Their other son Doc lived to be up in years + Doc had 3 sons + one his sons (Elija born 1876) married aunt Virginia E. daughter (Anna) also buried at Cherry Cemetery. S.L (Willene's husband) talked to John Rains great grandson by marriage he told S.L John Rains was a wealthy man. He not only had money he had gold + his great grandson said they never did know what John did with part of it + we believe he gave it to great grandma Nancy with Education grandpa + aunt Virginia E had we feel he helped her. " " ...as you can check John Rains was 29 when he died + our granddad was 14 days old. Weve ask different one cant find out what caused his death, weve also wondered if he knew grandpa was born or saw him. 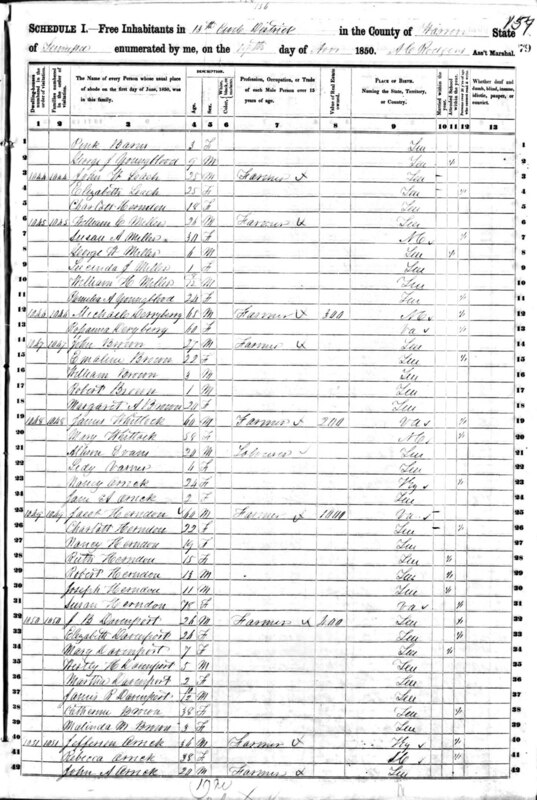 Uncle Isham said they grew up toghether + from some reason John Rains moved to Cannon Co... "
Only heads of households where shown in these census. Nancy would have been in the household of Allen Orrick and Martha during these years. Nancy Orrick, 24, KY, living with James and Mary Whitlock. J.K. Whitlock and Lucy Orrick are living next door, as are Nancy's mother Martha and kids. Also next door is the family of John Orrick who's children became Arrick. 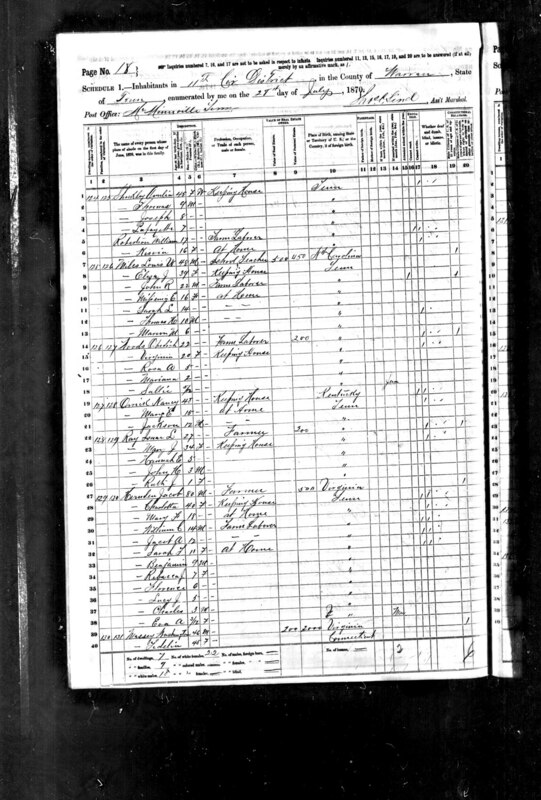 See Nancy in the 1870 Census. Next door to Nancy's daughter Virginia who is now married to Obediah Woods. 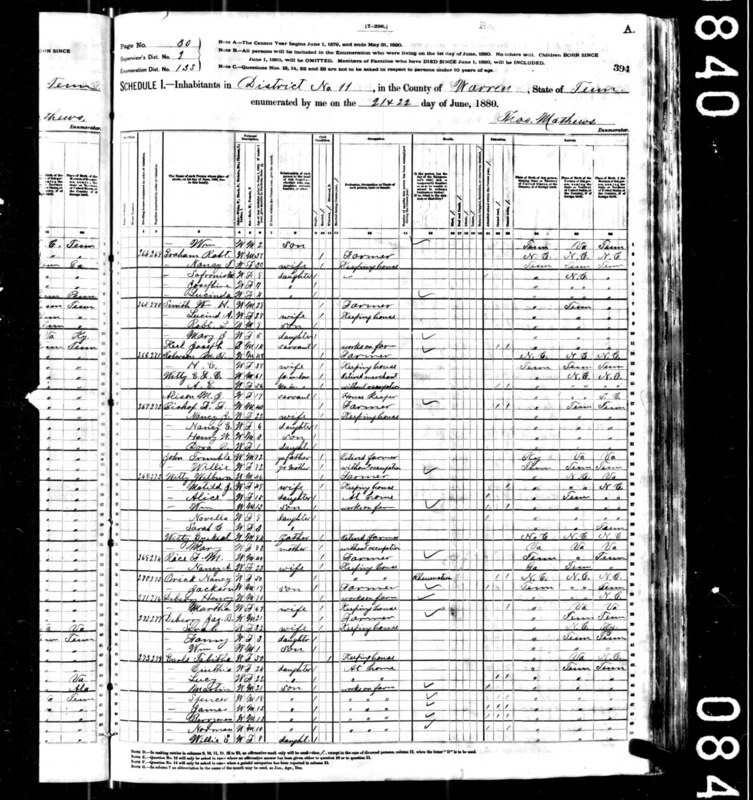 See Nancy in the 1880 Census. Living next to Henry Deberry, Whitty's, Rice, etc.